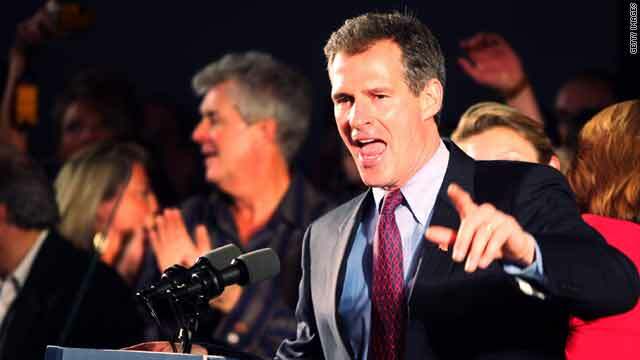 Scott Brown's victory in Massachusetts will change the political landscape for 2010, CNN Political Editor Mark Preston says. Washington (CNN) -- Look no further than the two warning flares shot up from Virginia and New Hampshire Tuesday evening to understand how concerned Democrats are about the political consequences of losing the late Sen. Edward Kennedy's seat to Republican Scott Brown. Sen. Jim Webb, D-Virginia, called on his Democratic colleagues to suspend votes on their controversial health care legislation, warning it would be wrong to try to muscle a bill through Congress before Brown was sworn into office. "In many ways, the campaign in Massachusetts became a referendum not only on health care reform but also on the openness and integrity of our government process," Webb said in a statement. Some 500 miles to the north, New Hampshire Democratic Party Chairman Ray Buckley sent out an urgent plea for donations to help fund a special election next month for a state senate seat he fears losing. "Over the past few weeks, radical right-wing activists turned Massachusetts into ground zero for the Tea Party movement, and we saw a taste of what's to come in 2010," Buckley wrote. Brown's victory has changed the political narrative in 2010. Traditionally, the president's party loses seats in the midterm elections. But now there is concern among some politically savvy Democrats who worry that the losses could be greater than originally anticipated in November all because of Brown's win. "It makes it really hard," a senior Democratic operative, speaking on the condition of anonymity, said Tuesday evening. "The frustrating thing for (Democratic) members is that it was preventable, it affects them and it was something that never should have gotten to this point." In a matter of two weeks, Democrats witnessed a sleeping Republican base come to life to rally around a little-known GOP candidate, who defied the odds to win the race to succeed the liberal lion from Massachusetts. And after watching two governorships slip from their grasp in November, many Democrats have come to realize that the American public is not particularly happy with their stewardship of the nation. Democrats have 10 months to try to regain the momentum, but the wind is now at the Republicans' backs, and their first legislative victory will likely be slamming the brakes on President Obama's signature domestic issue: health care reform. It is a mighty blow for a president, who just one year ago seemed unbreakable, unstoppable, unbeatable. If we don't figure out a way to talk to independent voters, we are done. Brown is an unlikely savior for the Republican Party, which one year ago was disoriented, disorganized and disillusioned. A Massachusetts Republican has successfully brought together -- for the time being -- a party at war over the ideological purity of its membership. There is still discord in the GOP, but Brown's win gives Republicans another case study in how to run a successful campaign after their two gubernatorial wins in New Jersey and Virginia. Martha Coakley's loss provides Democrats with yet another example of how not to run a campaign after their earlier losses in New Jersey and Virginia. One of the biggest challenges for Democrats is wooing back independent voters, who broke Brown's way Tuesday to help him beat Coakley. "If we don't figure out a way to talk to independent voters, we are done," lamented another high-level Democratic staffer, speaking freely on the condition of anonymity. Republicans wake up Wednesday morning with a new vigor, and GOP strategists vow to try to use this win to broaden a playing field that one year ago seemed unrealistic. The GOP's top target is Senate Majority Leader Harry Reid of Nevada, who is in danger of losing re-election, according to public polls. But Republicans hope Tuesday's victory also convinces some fence-sitting Democrats to follow the leads of Dennis Moore of Kansas or Rep. John Tanner of Tennessee and choose to retire instead of running for re-election. For Obama, the loss will likely force him to reconsider his legislative priorities, as his support on Capitol Hill wanes in this midterm election year. Conservative Democrats are less likely to back him on controversial issues such as health care and cap and trade, fearing that to do so would be political suicide. After all, Republicans were able to win Kennedy's seat by running against the Obama agenda.